Sometimes Santa's just not their cup 'o tea, is he? Merry Christmas and Happy New Year! Poor baby. Not quite who she expected to see. Merry Christmas. too cute! What a great capture! Merry Christmas! 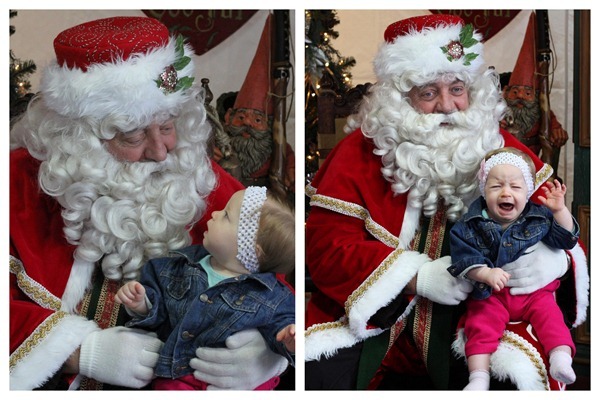 My daughter would cry, too, that's why santa doesn't bring the presents. The presents are suddenly under the tree but no sight of santa. I have several of those 1st Christmas pictures w/Santa. They are priceless. Merry Christmas to you and your little loves. Oh we all have those photos with our kids and give her another year or 2 and she will love the jolly old bloke – priceless pics for her 21st! Merry Christmas to you and your beautiful family. The photo on the left is just gorgeous malorgeous and a keeper. I hope you have a very lovely Christmas and a happy and healthy New Year. Merry Christmas from our House to Yours. Great picture to show her when she gets older. Christmas card – 2013??? Love your card this year – Happy New Year! ooh that is a nice looking santa, his beard looks real. how many of us have this same picture of their children. my daughter looks at it now and we just laugh. I'm a tad late her but Merry Christmas to you! Oh, my heck! That is adorable!!! priceless pics! I have turned my house upside down looking for a certain santa pic of my youngest, who is now 20! where is it!? these pics will be treasured for sure!